Where do I get my terrible, misleading headlines you may ask? I read way too much Yahoo! News. Anyway, I only call this the “shortest” game in MLB history because it was suspended in the middle of the 9th inning in a 0-0 tie last night. And that’s all folks. Even the Phillies players looked like they were laughing coming off the field. Good thing one-inning games aren’t standard. You could take a sip of beer and miss the entire thing. Commissioner Bud Selig announced today that the MLB All-Star Game would return to Cincinnati for the first time since 1988 when the Reds played at Riverfront Stadium. It will be the first All-Star Game played at Great American Ballpark, which will join Riverfront Stadium and Crosley Field as Queen City ballparks that have hosted the mid-season classic. With Great American Ballpark hosting the 2015 game, it will leave just Citizens Bank Park in Philadelphia, PETCO Park in San Diego, Nationals Park in Washington D.C., Marlins Park in Miami, Tropicana Field in Tampa Bay, and New Yankee Stadium in The Bronx as the only current stadiums not to have hosted the All-Star Game. The Reds franchise will join the Minnesota Twins (who are hosting the 2014 All-Star Game at Target Field) to host the festivities in THREE different ballparks. Here’s the glorious part about Great American Ballpark having the All-Star Game in its confines. It also gets to host the Home Run Derby! If there ever was a stadium that is perfectly set up for a derby, it’s the stadium that is lovingly called “the Great American Small-Park.” I’m already getting excited to see the games best mashers blasting homers. We could be there all night! Even better, is the Ohio River beyond the right field wall gives lefties a great target to go for. I mean if Juan Francisco could do it in an actual game in 2011, I think the game’s best could do it in a home run derby. I almost want to fast-forward to 2015 now to see it play out. I haven’t been this excited for a home run derby since Ken Griffey Jr. took aim at the warehouse beyond Camden Yards. I couldn’t resist thinking ahead to 2015 and who could actually be participating in the 2015 Home Run Derby. I’m going to use the 2012 format to project who will be launching mammos in Cincinnati. Captain Bryce Harper: The obvious player for this. He’ll be 22 and a possible superstar by 2015 if everything goes according to plan. Even better that he hits left-handed so the Ohio River will be in play. If this video from when Harper is any indication of his derby abilities, there will more splashdowns than a water park. Joey Votto or Jay Bruce: Have to get one of the hometown guys into the competition. I don’t want a Billy Butler situation here. Both are lefties which plays into my Ohio River hopes. I think that Bruce is the more likely of the two to participate as he’ll be in his prime at 28 years old. He also could be a legit 40-homer player by then. Giancarlo Stanton: This one I’m not sure on. He could be in the American League for all I know. We all missed out on Stanton participating in the 2012 Home Run Derby in Kansas City, but I think he’ll return for the derby in 2013 at Citi Field. That gives him a year to sit out in 2014 (sorry Twins fans) and come back to defend a potential title the way that Prince Fielder did this past year. I can’t have eight left-handed batters though sadly. This also gives me an excuse to show this video again. HE BROKE A SCOREBOARD. Jason Heyward: Alright a bit of a homer pick. Pun intended. Heyward showed that he has the potential to be a 35-homer player in 2012 when he blasted 27 yicketties. If the power continues to develop, he’ll be 25 for the 2015 All-Star Game and quite possibly could be the best right fielder in the game at that point. Also helps that, you guessed it, he’s left-handed! Captain Prince Fielder: I went back and forth on who potentially would be the captain for the American League. I settled on Fielder, who I wouldn’t be surprised if he takes a couple years off after winning the derby in 2012. He’s big, he’s strong, he’s a two-time champion, and he’s left handed. He’s going to want to eventually match Ken Griffey Jr. with three derby titles and I think he might wait til Cincinnati to do it. Plus, he has experience hitting it in the water. Adam Dunn: Hear me out on this one! A) He’s left handed B) He’s never participated in a Home Run Derby C) It’d be nice for him to have his first one in Cincinnati where he used to play. He’ll still only be 35 at that point. If he was ever going to give it a go, I think the lure of doing it in the Queen City would be enough for him. Especially with the Ohio River calling his name. Yoenis Céspedes: If Céspedes was left-handed he’d be a dream for this future derby. However, he will still be a great option. He’ll be in the heart of his prime at 29 years old. If he stays healthy, he’ll be a potential All-Star for Oakland. We all know he has some major power too. Especially after seeing this. Wil Myers: The game isn’t until 2015! I have to have one player that hasn’t even played in the Majors yet to speculate on, right? I’m going to go with Tampa Bay’s future star in Wil Myers. Myers has the best power potential of any prospect right now. I’m deeply saddened though that I’ve now put three righties on the American League side. Maybe Robinson Cano won’t be broken up and come back to try the derby again? Who would you want to see take aim at the Ohio River in the 2015 Home Run Derby? Let us know in the comments! Jeremy Dorn (@Jamblinman): Numbers four through 10 don’t really matter all that much; this is a three-horse race. Even though the Pirates and Brewers both fell short in their postseason quests, you can’t discount the seasons each team’s star player had. But to out-gallop Posey, who has been the catalyst behind the Giants’ runaway division title, is much too difficult. That being said, I like Posey to take this award, as his team ran away with the NL West, and the rest of the field barely snuck into the playoffs or missed altogether. If the Brewers had made the postseason, Braun would have won. If the Pirates had even managed a slightly better August and September, I’d give it to McCutchen. But as it stands now, there is no more important player to one single team than Posey. Angelo Fileccia (@GODF_TH_R): Buster Posey had the best 2nd half of any player in the majors and led the Giants to an NL West championship. Buster’s post-all-star numbers (.389/.462/.644) propelled him to an NL batting title (.336). Posey becomes the 2nd catcher in 70 years to win a batting title (Joe Mauer) and the first NL catcher in 100 years to win the on-base percentage stat. Brian Boynton (@GingaBeard_Man): Ryan Braun proved this season that he may actually have been telling the truth about his alleged steroid use. His power numbers are better this year: Home Runs 41 to 33, RBI 112 to 111, and he did this without Prince Fielder being in the lineup. Buster Posey has been a stable force behind the plate and at it. He lead his pitching staff to the fifth best ERA in the NL. He played in 147 games hitting .337 with 24 home runs. McCutchen was almost able to lead the Pirates to their first winning season in 20 years. He set career highs in batting average (.327), Home Runs (31), and RBI (96). Was there a bigger surprise this season other than R.A. Dickey? The knuckleballer beasted up this season finishing with 20 wins for the New York Mets while having a 2.73 ERA. He set career highs in almost every statistical category. Not bad for a 37 year old. Kurt Peter (@FalconKP): Looking at the NL MVP selection, people may still be hung up on this summer’s PED scandal, but Ryan Braun has been tearing the cover off of the ball. He leads the league in HRs, total bases, slugging, and OPS. He is in the Top 5 in runs, hits, OBP, and average, while being 9th in steals. Only he and Mike Trout have a 30/30 season and has only the 11th 40/30 season in Major League history. It’s no question: Ryan Braun is the NL MVP. Bryan Mapes (@IAmMapes): Andrew McCutchen was atop my rankings for the previous three months and I thought that if he got the Pirates to the playoffs he was a lock. If the Pirates finished above .500, he was going to have a good chance. Instead, the Pirates fell below the .500 mark again and I seriously debated dropping him to 4th, but his overall offensive numbers (1st in offensive WAR) saved him. This opened the door for Buster Posey and Ryan Braun to have a tight 1-2 battle for me. Braun’s raw numbers are better and is the better power-speed combo, but Posey led the NL in OPS+ which takes into account park factor and opponent that was the difference to me. I was surprised to see Braves Michael Bourn and Craig Kimbrel only on my ballot as Bourn provided a spark atop the Atlanta lineup and Kimbrel had arguably the most dominant season by a closer striking out more than half the batters he faced. I wish I had room for Chipper Jones, Jason Heyward, and Martin Prado. Prado did anything and everything for the Braves this year. I’m also sad that I had no room for one of my favorites Giancarlo Stanton, if he was healthy the whole season, things might have been different for Miami. 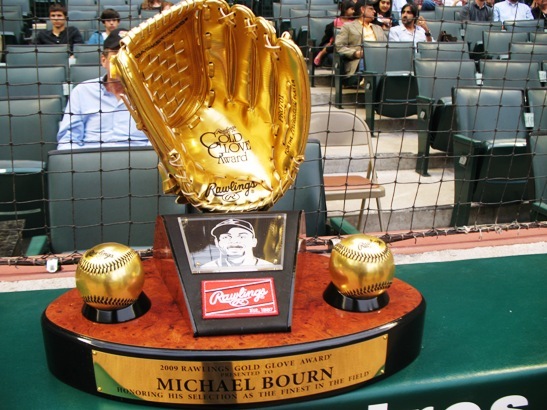 Congrats to Giants Buster Posey on winning the 3U3D NL MVP! 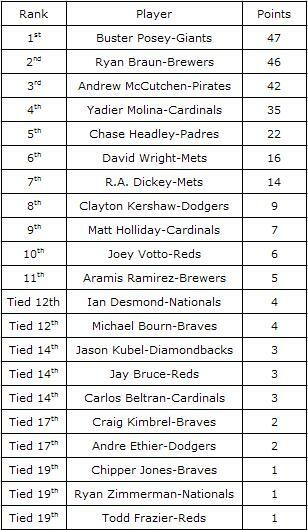 Who’s on your NL MVP ballot? Let us know in the comments or if you want to debate our ballot, hit us up on Twitter!